Sales Engineers/PreSales participate in the sales process with account executives to close the sale. Professional Services provides customers software customization and training. Customer Success Managers nurtures and expands the accounts. The Learning Team provides customers ongoing help with best practices, knowledge bases, webinars to maximize product use and drive retention. Here’s how the process works. In the sales step, an account executive (with a sales development rep/SDR) qualifies a prospect. At or close to the time of sale, the account executive partners with member of the sales engineering team and/or the services team to set the right expectations and scope any custom work or training to be done. The sales engineers (also called presales) report to the head of customer success to ensure the company can satisfy the customer’s needs, set the customer up for success and mitigate potential churn from overpromising. 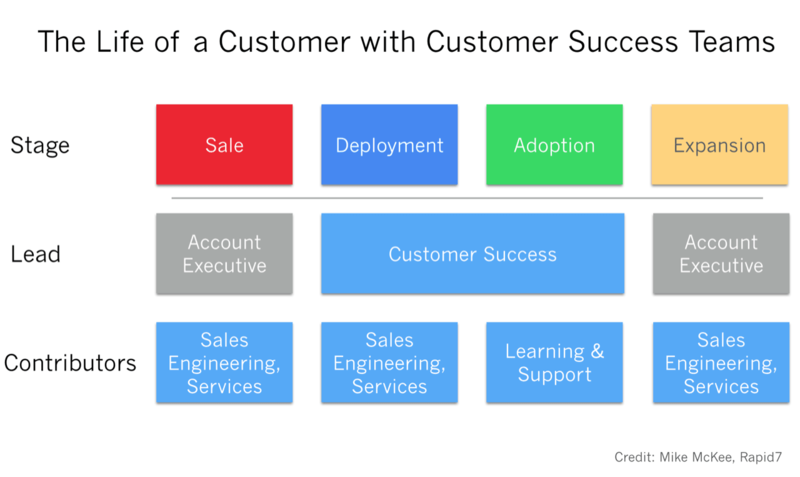 In the deployment phase, the account executive passes the role of customer relationship lead to a member of the customer success organization. The customer success manager works with sales engineering and services to ensure that all the promised work has been completed successfully. In addition, the learning team provides knowledge to the customer and the rest of the in-house team. This learning should encourage the customer to use more and more of the feature set, or spread the product internally, which leads ultimately to account expansion. At this point, the customer success manager (CSM) passes the relationship lead back to an account executive, which can be the same as in the Sales process. In other cases, startups employ dedicated upsell sales teams. In yet other cases, startups ask their customer success managers to upsell and add a quota to their CSM’s compensation structure. In this chart above, the people in the customer success organization are in blue. Only account executives report to the VP of Sales. Everyone else reports to the SVP of CS. While many SaaS startups employ this type of organizational structure, there are a few variations on this model that work very well. When structuring a customer success organization with however many teams and team members, there are two critical things to consider. First, aligning goals properly (ex. presales reporting to the head of CS), and second, building and refining the processes to create seamless handoffs to and from relationship leads at each sale of the process.